Unseeded Boris “Boom Boom” Becker blew away Kevin Curren in four sets to win the Wimbledon title. And then four years later, a diminutive Michael Chang would stun the world by outlasting a Stefan Edberg at the peak of his powers, in a five-set marathon final of the 1989 French Open, becoming a Grand Slam Champion at an even younger age. Chang had just turned 17. The world of women’s tennis was seeing its own blooming of young talent as well with Monica Seles at 17 and Steffi Graf at 18 winning their first Grand Slams at Roland Garros. Serena Williams followed with her first US Open at the age of 18. So by the time Rafael Nadal beat Roger Federer on his 19th birthday and then defeated Mariano Puerta to win the 2005 French Open in his very first appearance at Roland Garros, we had got quite used to the idea that modern tennis had become a young person’s game. And then came the era of Roger Federer and Rafa Nadal in the men’s game, with then the addition of a a relative late bloomer in Novak Djokovic. At the same time we experienced the complete dominance of the Williams sisters in the eomen’s game. For tennis lovers the world over, this has been an age of Tennis Nirvana. 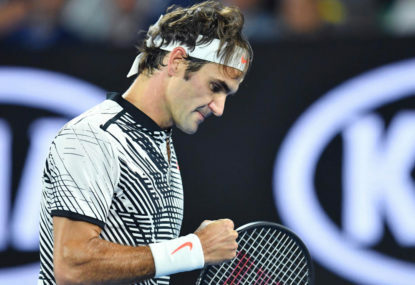 An age that is now about 12-years long, and if this past week at the Australian Open is anything to go by, this dose of Nirvana has just got a new life for a couple of years more. We have witnessed some mind numbing display of tennis from four players, who, if age were to be the defining criteria, should be managing their glittering new tennis academies and top end fashion lines instead of sending jaw-dropping, cross-court returns and delectable drop shots that leave their significantly younger opponents stranded in mid court. They have sent us into the throes of ecstasy this week, straining our vocal chords in trying to express our wonderment at their exploits. And this weekend, they will be contesting the men’s and women’s finals of the biggest tennis tournament in the Southern Hemisphere. While we celebrate their Herculean efforts, it might be worth noting that this also signals that all is not well with the world of tennis. There are 16 men and women competing at the five finals of this Australian Open (Men’s, Women’s, Men’s Doubles, Women’s Doubles and Mixed Doubles). And 14, yes, 14 of them will be over the age of 30 next week. That surely cannot be a good sign for the game. What’s most worrying is that it’s not only that these players are showing the youngsters how to play at the highest level of the game, but the talent cupboard in both men’s and women’s tennis is less than overflowing. A look at the top 15 in men’s tennis is extremely revealing. There are only three in that list who are 25 or below. Nick Kyrgios, as we have discussed ad nauseam on The Roar, including in my piece on him a few months ago, is not in this for the love of the game, and it shows in his attitude and in the end in his less than stellar results despite his undeniable talent. Dominic Thiem seems like a player who is always at the cusp of making it, but his game lacks the spark and the killer instinct just as we saw with Andy Murray for about the first decade of his professional life. Grigor Dimitrov came of age in the Australian Open semi-finals this week against Rafa Nadal. And yet, despite playing the best tennis of his life, he came away second best to a man who had been out of top level contention for more than a year. Women’s tennis is, in slightly better shape, from this parameter. Three of the Top 10 are below 25. Muguruza, Pliskova and Madison Keyes are all very talented. As are their slightly older fellow rankers. But what they lack is the consistency, and perhaps the will and mental strength to go that extra mile. If that were not the case, Serena would not be ruling the courts at the age of 35, and we would not be preparing for the ‘Williams Sisters Show’ at the Rod Laver Arena tonight. As we get ready to enjoy the last few tournaments of sublime celestial tennis from our resident Gods and Goddesses, it’s time to be worried about the standards of the game in the coming years. Throwing money at the top level of the game has had a limited impact. Becoming a multi-millionaire before he turned 21 hasn’t made Kyrgios fall in love with the game or care about those of us who watch it and fund his lifestyle. It has not made Thiem work any harder to raise his game at a time when he should have been at the top of the world rankings based on early promise. It has not brought out an exceptionally motivated young women’s player with the kind of commitment a Serena, a Martina, a Steffi Or an Evert brought to the game. Get prepared for a ‘barren decade’ of tennis that will be upon us soon, unless in the next two to three years, a new crop of players emerge out of the desert of tennis talent that lies before us.